With activities focussed on Digital Infrastructure (data science, machine learning, cybersecurity and next generation networks), Digital Industry, Digital Wellbeing, Digital Cities, and Digital Finance the results and impact of EIT Digital are at the heart of the priorities recently identified by the European Commission and national governments. In the recently published proposal for the 2021-2027 EU budget we see increased investment in Digital through a strong EIT (Digital) in Horizon Europe (overall increased focus on Digital) and an additional €9 billion Digital Europe program. Several EU member states have announced increased investments in digital technology, notably Artificial Intelligence and Cybersecurity. On 11 September, we presented and discussed at our third annual conference in Brussels EIT Digital's results on digital entrepreneurship and skills. Successful execution of those plans needs talents, skills, technology and new business ideas. Since our launch, EIT Digital equipped more than 1,500 students with the skills to innovate and become entrepreneurs; we supported more than 270 startups and scaleups to grow internationally, created 60 new companies as a result of Innovation Activities, and launched more than 250 products and services commercially. EIT Digital continues to build on these strong achievements! We welcome the increased investment in digital skills and technology at EU and member state level. This strong mandate allows us to have global impact through European innovation fuelled by entrepreneurial talent and digital technology. 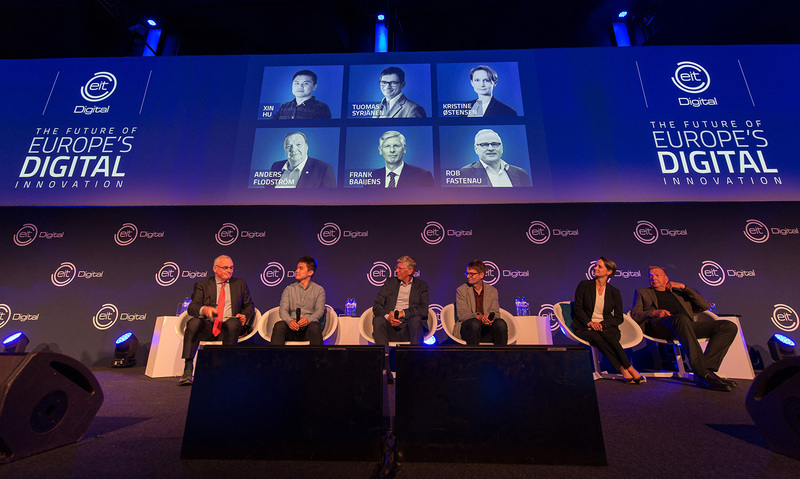 EIT Digital's third annual conference in Brussels.